Provide comfort for the family of Lewis Young with a meaningful gesture of sympathy. Lewis E. Young, 82, of Hopkins, Missouri passed away unexpectedly on Thursday, January 24, 2019. Lewis was born on October 1, 1936 in Hopkins, Missouri to Francis Lee and Esther Mae (Wiseman) Young. Lewis was a 1955 graduate of the Hopkins High School and member of the First Christian Church of Hopkins. He was a farmer and enjoyed hunting, fishing and spending time with his grandchildren. He married Doris Lee Davis on December 1, 1954 in Hopkins, Missouri. She survives of the home. Additional survivors include one son, Steve (Janet) Young, Savannah, Missouri; two grandchildren, Brandi Young (Mike Taylor), Kaylee (Matt) Brandt; three great-grandchildren, Jayde Garber, Teegan Brandt and Kason Brandt and many nieces and nephews. He was preceded in death by his parents, one son, Randall Young and one brother, Eldon Young. Services 2pm Monday, January 28th at the First Christian Church, Hopkins, Missouri under the care of Price Funeral Home. Burial Hopkins Cemetery. Visitation will be held from 2:00 to 4:00pm Sunday, January 27th at the church. The family suggests memorials to the First Christian Church. Online condolences can be made to the family at www.pricefuneralhomemaryville.com. 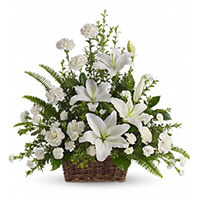 To send flowers in memory of Lewis Eugene Young, please visit our Heartfelt Sympathies Store. Kelli, Emily, Heather & Christina sent flowers to the family of Lewis Eugene Young. Kelli, Emily, Heather & Christina purchased the Peaceful White Lilies Basket for the family of Lewis Young.